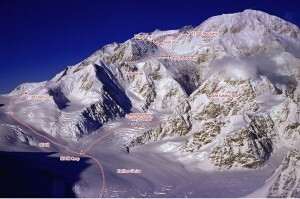 The West Buttress of Denali is the most popular big mountain climbing route in all of Alaska. Of the 1,000 to 1,300 climbers that attempt Denali each season, 85 percent head for the West Buttress. Roughly half of them stand on the summit. The route is popular with apprentice and expert climbers alike. Less experienced climbers can test their skills at cold and altitude on a route that is non-technical and straightforward. More experienced climbers will find an excellent chance for acclimatization for harder routes, as well as a myriad of difficult variations should they be so inclined. The route is internationally famous as well. Each year hundreds of climbers come from around the world to attempt this Alaskan giant. Despite the inherent crowds, all climbers will find the West Buttress to be one of the most beautiful and scenic places imaginable. From the wide expanse of the Kahiltna Glacier, to the extensive views of the surrounding peaks and the unending view of the tundra to the north, the West Buttress is an outstanding climb and grand achievement for anyone. Which SuperTopo guidebooks include a topo for West Buttress?